BBC NEWS | Have Your Say | Should euthanasia journey be allowed? Should euthanasia journey be allowed? A High Court judge has lifted an injunction banning a man who wants to take his chronically-sick wife to Switzerland for an assisted suicide. Her degenerative illness meant she could not travel unaided and the court was asked to decide if her local council should stop another person taking her to a country where euthanasia is legal. The Voluntary Euthanasia Society (VES) has welcomed the case, arguing the law needs to be clarified but the Pro-Life Alliance said no clarification of the law was needed. Do you agree with this ruling? Do you think it is the role of the courts to prevent this? What impact will this case have on euthanasia in Britain? The real problem here is that this poor woman is forced to travel to another country to die. I'm sure she would be much happier to stay where she is. Quality of life is very important, I for one would not want to be kept alive by artificial means and if I loose my mobility and personal dignity I would rather end it there and then. We need a change of law in this country. I just don't understand how deciding how and when you die is not a fundamental human right? I don't think a UK Court can prevent someone from travelling abroad for a purpose which is illegal in the UK (like smoking marijuana or pistol-shooting, or maybe, in the future, fox-hunting). The issue here is whether another person who accompanies her would be committing an offence. I'm not a lawyer and can only express my view that she should have the right to be accompanied. I think that governments really ought to stop interfering in people's lives. This woman is a responsible adult and so if she wants to travel abroad to commit suicide, she should be allowed to. However tragic the circumstances assisting a crime is the same as committing it. No question to answer. Her life. Her choice. Her business. In response to Isabelle's comment. It's not that she is going somewhere to do something that is illegal in this country, but that someone is actively helping her to do so. In taking her abroad knowingly to commit suicide can be seen in the same light as handing her a pistol. The crime has therefore been committed in this country by a resident of the UK, and is punishable by a prison sentence. The only way to not make criminals out of loving, family members is to legalise euthanasia, with the strictest guidelines. Why do other people have to interfere in the decisions of others? This poor woman should be allowed to travel abroad and finish her life the way she has lived it - by making her own decisions. Why do other people have to interfere in the decisions of others? Throughout life you make your own decisions and your own destiny without the need for interference from others, why should a choice for a dignified death be any different? I don't think this issue should be resolved in a court. It's beginning to get to the stage where unelected judges are having more say over controversial issues such as assisted suicide then parliament which is where these decisions should really be fought out. I thought we lived in a free country? They should let the poor woman travel, after all it's her decision no one else's. All the people who are against it aren't suffering with her illness so its easy for them to dictate. If she is given the green light, a relative should use a pillow to snuff her out. If you think my comment is in bad taste - then you have already answered the question.... Human life is too precious. It seems absurd that someone has to make a journey to another country in order to end their suffering. Surely we need a change in our laws to help people with terminal illnesses suffering like this? It seems to me that the local authority is committing a serious offence against the Human Rights Act by interfering with the woman's right to travel and her right to privacy, and should be prosecuted accordingly. I really feel for this family, but the court should not allow this as it would be another step towards legal euthanasia here. We cannot condone the assisted taking of a life. It is notable that the majority of the medical profession disagree with assisted suicide. I think so. If moving to another point in space-time is allowed where there is a society which abides to different rules of life then freedom to move there should be allowed in any case. This is another example of where this government is out of touch with public sentiment. Lets have a proper debate over important issues rather than wasting parliament time banning fox hunting. God gave everyone life and only He must be able to take it away - it is upsetting that "assisted suicide" exists, even if not in the UK. If anyone, who is sound of mind, is willing to die because of chronic suffering they should be allowed to. Who has the right to prevent someone's own wishes? We don't allow animals to suffer, why should humans have to? We don't allow animals to suffer, why should humans have to? It's wrong that an animal, who cannot tell you it is in pain, is put down to save it from suffering. Yet a human, who can tell you the suffering and pain they are feeling, and who can request assistance in stopping it, is made to continue in distress. To me it is senseless, heartless, and goes against an individual's right to freedom from such misery. Anyone who has witnessed the suffering and humiliation a terminally ill person and their family goes through would not fight against euthanasia. It's a disgrace that this poor woman and her family are having to suffer through the stress of this hearing on top of the grief and suffering they already bear. Why do cases like this always end up in court? Why should the medical service think they know what is best for people? How can a court decide what is right? The only person who knows what is best is the lady (in this case) let her decide what must be done. 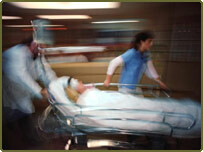 I believe that the majority of the medical profession oppose euthanasia for personal rather than professional reasons. Doctors may personally oppose abortion, but it is allowed by law. Why should this be any different? There are, as always, a lot of times when euthanasia is the only option but because of law the person concerned has to suffer and no-one should be left in pain. I cannot help but wonder who decides who is suffering enough to constitute euthanasia and who is not suffering enough. Restricted movement is wrong, if a person wants to leave the country of their own free will then that is there choice. Once in a different country they should obey that nation's laws. The government can advise, deport, help investigate and protect its own (i.e. by refuse re-entry or arresting people who has been training as a terrorist) but it cannot imprison someone in their own country. There should be limits to what the government and other people can intervene in, we live in a democracy we rule them not they rule us. Yes. This woman should be allowed to travel to end her own life. Why shouldn't people have the right to end their own suffering? When our animals are suffering we take them to the vet to be put to sleep because it is the kindest thing to do. The last thing people want to see is their loved ones suffering. To what end does continuing people's lives who are terminally ill achieve? Anyone who has had to watch their loved one linger to a painful end would welcome this peaceful outcome. How sad it is to read the comments on this page by people who feel that this woman should be allowed to travel abroad to die. How precious is the gift of life and how much we take it for granted, is a sad reflection of how everyday we step closer to the abyss and move further away from every moral action that makes us human. It seems to me that it is so much easier to send this woman off to an early grave than to spend time, money and effort in relieving her of what is clearly a depressive state in which she feels she adds no worth or value to human existence - how terribly wrong she is. My father died some years ago of a brain tumour - even at the end I never gave up hope that he would recover until he breathed his last - life is short enough as it is without us interfering in the natural order of things. Absolutely Yes. A member of my family is terminally ill and it is awful to see her waste away, she cannot do anything for herself and relies totally on other people. This is not a dignified way to die, and in such cases people should be allowed to commit suicide or assisted suicide. We would not allow a pet to suffer yet it is ok for a human to suffer - needlessly. If a person wants to be helped to die it should be allowed. How come we permit abortion i.e. killing without permission of the baby and yet question assisted suicide? What hypocrites we are and what a lack of real compassion we show. Euthanasia is a more dignified death. However I worry that it will then be extended to people who are mentally and not physically ill. What if someone wishes to end their life because of exam stress, a relationship breakdown or depression? Where do we draw the line? People in those circumstances are not in their own mind and may come out of that depression later, meaning the suicide was not necessary. It echoes Diane Pretty's case all over again and it does sadden me to see anyone suffer so much. I hate taking the easy way out of anything, but this I cannot decide upon. It always amazes me that people find it perfectly acceptable to end the life of their suffering pets for compassionate reasons, but don't give their own flesh and blood the same degree of compassion. How many more people are to be subjected to torture inflicted by illness, made to feel helpless and out of control of their own lives, just because some do-gooders can't keep their noses out? A person should be allowed to die - if it is their wish - if they are living in great pain, constantly suffering and cannot be cured. To live, under these conditions, is not living, it is existing. Where there is no quality of life whatsoever and severe pain is un-abating then an individual should be awarded the right to die with dignity and compassion. Does any human have the right to tell another that they must live with pain & suffering? I don't see what the issue is here. If this ill lady wants to go to Switzerland, and someone is willing to go with her, I don't see how that can be illegal. If she then chooses to commit suicide while she is in Switzerland, that is no business of the person who took her. The journey should be allowed. I fear though that this woman's personal choice will be denied by the religious who will interfere as usual with their primitive superstitions and prejudices. I have said this time and time again on the subject of euthanasia. If someone wants to end their own life, that should be one of their fundamental human rights. Provided that they choose to die in a way which will not cause harm to others, I cannot see what the problem is, regardless of their illness! The fact that the woman in question needs help to travel to a country where assisted suicide is lawful should not make this case any different. The court should treat it in the same way they would if someone were planning to travel abroad independently, with a possible intent to seek assistance to end their life in some dignity. It is not the role of the state to intervene in such cases. I don't understand why our own ultimate possession, our life, should not be ours to finish at the time and using the method of our choice. To me it's the ultimate restriction of a person's rights. If it is obvious that the individual has made the choice out of prolonged suffering then who has the right to argue? It seems this woman has sufficient life left in her to enjoy what remains rather than waste time fighting a court battle. I feel for her position but let others such as relatives etc carry on the fight while she gets on with living. Euthanasia is just the politically correct word for suicide. Suicide is illegal in this country, as is assisting someone to commit suicide. The law reflects the sacredness of life, and long may it continue to do so. While I am not standing in this woman's shoes & cannot feel what she is feeling, surely it can never be right to kill someone, even upon their own request? It is a heavy moral burden for those asked to assist to carry & I am not sure it is actually morally acceptable to lay that on anyone, however sick you may be yourself. Yes, journey should definitely be allowed. Give this woman the chance to die with dignity, rather than hang on unnecessarily. We don't cause animals to suffer in this way! Sad as it is, you cannot kill people - with or without their consent! I think there is a world of difference between a lawful assisted suicide and euthanasia. The first implies that the death is voluntary, the second that it is not. If I thought that I was going to spend the rest of my life with absolutely no quality to it, I think I would probably do the same thing. Ultimately shouldn't it be her choice, not the courts? She has made it perfectly clear, by asking for this assistance herself, that this is her wish. Personally I believe that in cases such as this euthanasia is the only dignified way to end things. I would want the same for myself if the situation arose. Allowing a person to travel with her should be viewed more as a giving her a guardian to ensure safe passing to a better more peaceful place rather than an accomplice in a suicide effort. What makes all this so poignant is that the poor woman who is so tragically at the centre of all this is now suffering additional stress, further grief and loss of what remains of her dignity. My heart goes out to her. Yes, this would be a half-way position on an on-going debate. For those against, it will not allow a floodgate scenario. For those for euthanasia, we will have some control and preparation should we require it. I don't see the difference between travelling to Amsterdam to smoke marijuana (which is illegal here) and travelling somewhere for Euthanasia. Obviously the second decision is more grave and serious, but in both cases you are travelling to another country to partake in something that is illegal in your own. Of course this woman should have the right to do what she thinks is right for her - if she can't do it on her own, then elsewhere. There are major civil liberty issues in preventing this woman's travel. What next? Put her in a cage and monitor her 24/7? Euthanasia should be made law in Britain, but only after checks and balances are in place. What we don't want is murder disguised. Every living being has a right to a dignified death should they so desire. If this woman wishes to die with dignity rather than have her life artificially extended by doctors that love to play God then she should be allowed. What's the point keeping her alive? She is obviously miserable and wishes to die. Doctors need to remember their job is to heal and comfort, in this case they are doing neither, they are simply prolonging her existence to suit their own vanity. Sad as it is, I think the court should disallow this. A line needs to be drawn somewhere. While switching off life support is in my opinion acceptable in some cases, encouraging or assisting suicide is different, and is wrong. Allowing it just once will inevitably open up a massive can of worms. If someone is of sound mind, what they do with their life should be their decision, end of.